"We are at a good moment, most of all in terms of confidence. We can't be our own worst enemy by relaxing, being complacent, the team has to give the maximum, work more than our rival, be ambitious, if we don't do that any team can give us problems. We have to be humble, keep our feet on the ground and start each game with that winning determination we hjave seen the last few games, they need to become addicted to winning. Winning 6 games on the trot isn't easy, I would like to continue and to do so we need to keep the hunger"
"It's very important that the fans and the press keep their feet on the ground and all pull in the same direction. 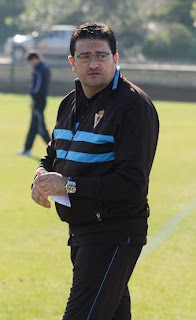 We are proud of the run we are on but we haven't achieved anything yet"
"I have experience of a segunda B promotion when the last 4 games didn't mean anything. Teams can lose concentration by being qualified too early, I have that experience and it isn't good. If I could choose, I would prefer to reach the final suffering"
Good stuff......we can't afford to relax, and it is a good thing that Sevilla are still hanging on to our coat-tails. Tomorrow's home game with Ecija (who sit in 8th, but are 6 points out of the play off zone) kicks off at 17.30 p.m., thats 16.30 p.m. UK time. IF you can get a feed from the official website, they are carrying the game. If not it's the excellent radio commentary from the exitable Jose Manuel Sanchez on the club radio, if your spanish is good enough to follow it. Just remember.....if you hear "gol" it means we have conceded....if you hear "GOLGOLGOLGOLGOLGOLGOLGOLGOLGOLGOLGOLGOLGOLGOLGOLGOLGOLGOL" it means Real have scored. EASY! Photo : Iñaki Alonso....el jefe....whatever happens in the play off, whatever the "experts" in our local press say, he has done a magnificent job this season. I hope he will be Real's coach for years to come. Actually got the feed for the game yesterday,first time for a couple of weeks a tough game but Pedro what a calm man with a pressure penalty & I think we lost the width a bit too much when he was substituted not long after.What a valuable 3 points though.